After decades of playing catch-up with its neighbours, Santiago has undergone a renaissance in the past few years and is brimming with new bars, hotels, museums and cultural centres and hotels that are worth your time and your money. 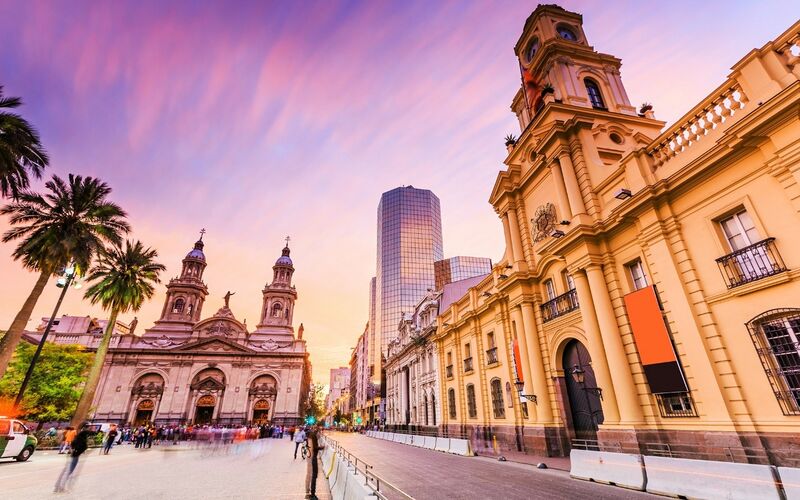 What’s more, Chile’s capital is safer than Rio and more welcoming than Buenos Aires, making it a gentle introduction to South America. 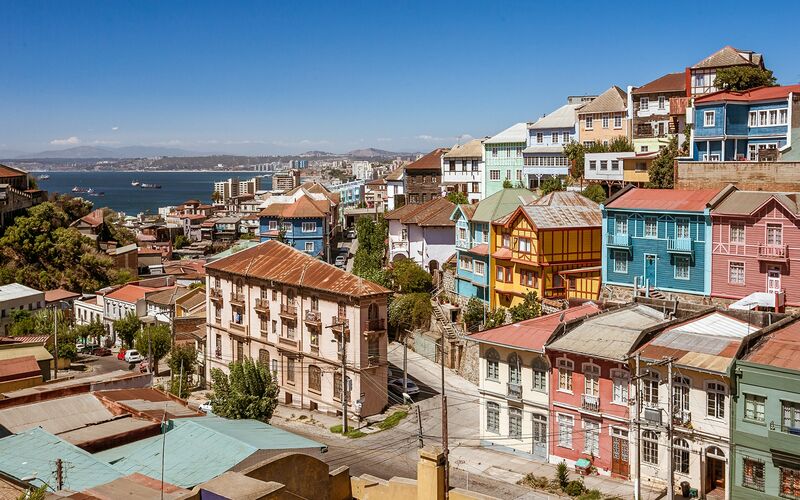 Cruises no longer dock at Valparaiso (owing to berthing issues) but at San Antonio, one of the busiest ports on the western coast of South America with roots dating back to the 16th century. 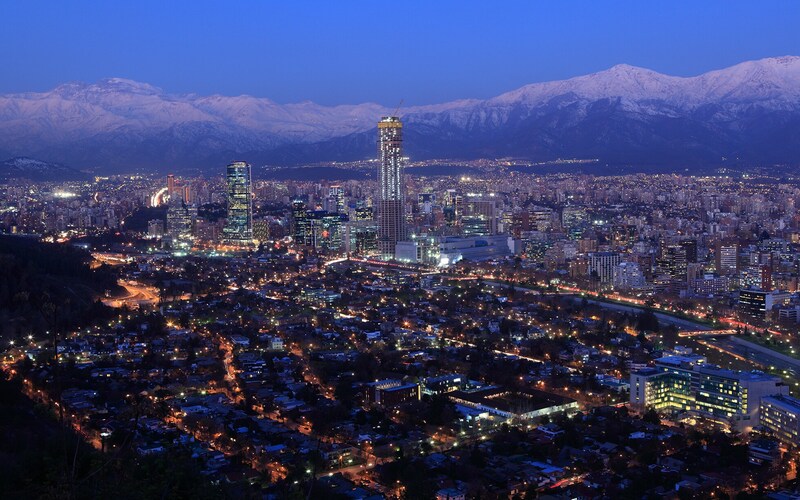 San Antonio is the gateway to Chile’s capital, Santiago, (approximately an hour and a half away). In a word, no, as the port lies 3 miles (5km) from San Antonio proper. Getting to San Antonio is easy: Uber and taxis are readily available. However, most passengers opt to skip Port Antonio and head straight to Santiago either on a ship excursion or by bus (try Pullman). Since Santiago is flat, the best way to explore is on foot or (if you’re up for it) by bike. The metro is also a cheap and convenient way to reach the city’s top attractions and travel between barrios, as are buses. At night, take a taxi but be sure to hail only those with yellow tops so as to avoid being scammed. 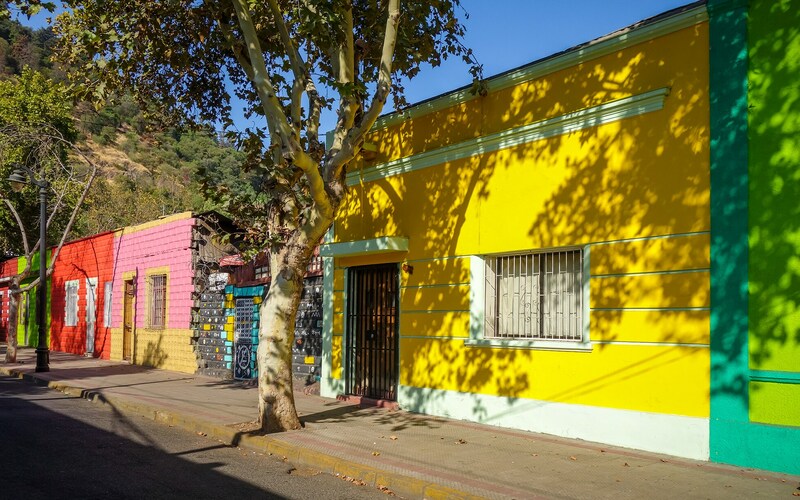 Characterful barrios (neighbourhoods), beautiful mountain backdrops, cutting edge art venues… Santiago rewards a visit. 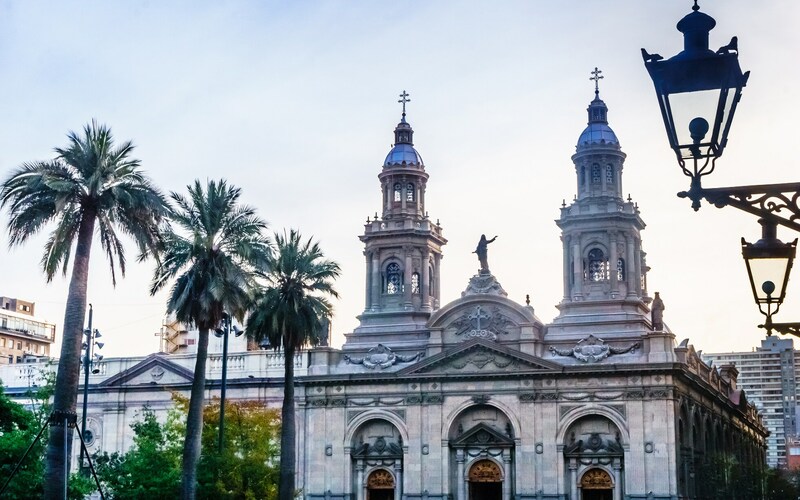 Passengers’ first port of call should be the buzzy Plaza de Armas, which as served as the symbolic heart of Santiago since the city’s founding in 1541. This attractive square, whose fountain honours the famous liberator Simon Bolivar, is flanked by iconic sights including Catedral Metroplitana; a neoclassical cathedral that was built between 1748 and 1800. 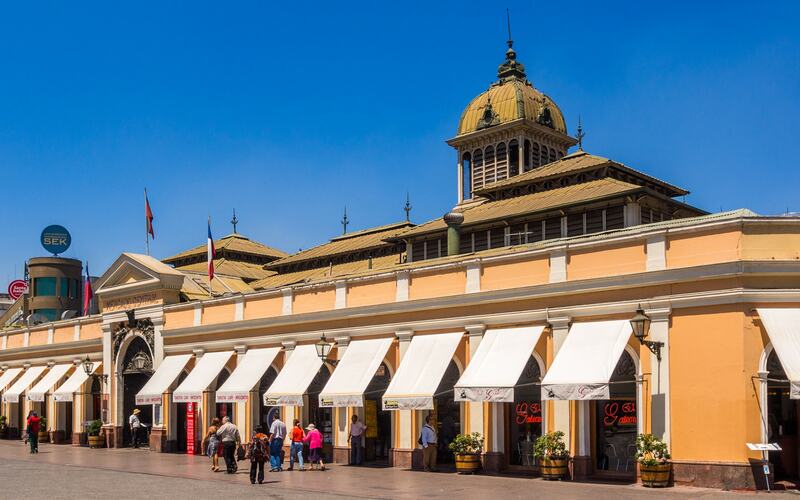 However, if you’ve been in South America a while and are suffering from cathedral fatigue – it can happen – check out Centro Cultural Palacio La Moneda, which consists of two exhibition spaces, a gallery, movie theatre and a fabulous fair trade crafts shop (the perfect spot to snap up a few Santiago souvenirs). Another striking cultural centre worth seeing is Centro Gabriela Mistral, named after the first Latin American woman to win the Nobel Prize in Literature. And don’t miss the Musueo de la Memoria y los Derechos Humanos (the Museum of Memory & Human Rights). Situated in barrio Yungay, the museum – which exposes the terrifying human rights violations that occurred under Chile’s military government between the years of 1973 and 1990 – makes for sobering but essential viewing. When hunger pangs kick in, seek out Mercado Central. Grab a table at one of the stalls around the edge (the ones in the middle are aimed at tourists and subsequently boast tourist inflated prices) and enjoy a sensational seafood lunch for a snip. Even if you don’t adore seafood, the lively market is worth visiting for the atmosphere and photo opportunities alone. Got eight hours to kill? After you’ve followed the four hour itinerary, tour La Chascona – the house where Pablo Neruda (the Nobel Prize–winning Chilean poet dubbed ‘the greatest poet of the 20th century in any language’) once resided with his mistress, Matilde Urrutia. Then take the funicular up to the top of Cerro San Cristobal for arresting views of the city. Back in Santiago, time permitting, potter to Patronato. Not too many visitors cross the Rio Mapocho river to Patronato, but those who do quickly discover its delights: the barrio buzzes with Santiago’s Arab and Chinese immigrants peddling everything from Chinese slippers to sweets for a snip. Patronato is also home to Cementerio General (where Salvador Allende, was laid to rest) as well as the memorial to those who disappeared during Pinochet’s brutal dictatorship. Most cruise lines offer excursions to all of the above but it is perfectly possible to reach the highlighted destinations under your own steam. You can’t leave town without eating at least one empanada, aka Chile’s national dish. (Salvador Allende famously celebrated his election as Chilean president in 1970 “with red wine and empanadas”). These seriously addictive stuffed pastries are sold all over Santiago but the best ones are to be found at Empanadas Zunino, an old school bakery over on Puente Street. The classic version is filled with pino (meat) but other fillings on offer include chicken, seafood and, for veggies, queso (cheese). For something more substantial, Lomo a lo pobreaka – steak topped with fried eggs and French fries – is a Chilean classic. Las Onces is what Santiaguinos eat in the evenings: expect to enjoy a light meal of tea, sandwiches and a slice of cake, all of which is consumed around 6pm. 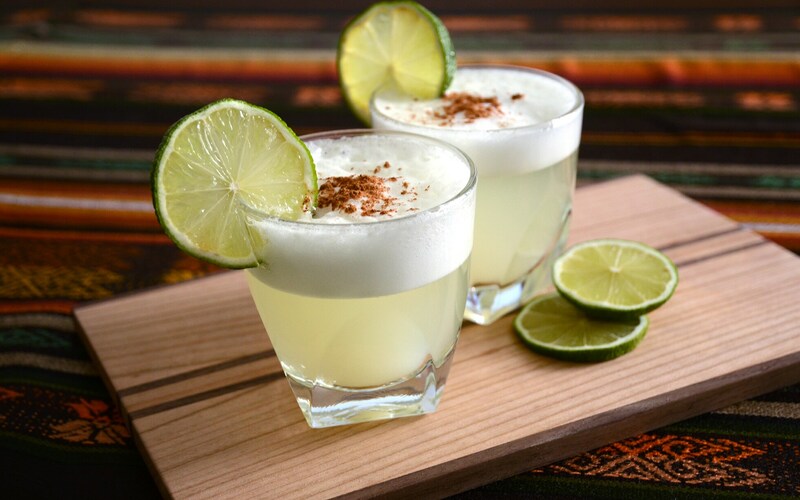 The drink to try is, of course, the Pisco Sour (Chile claims to invented this cocktail which sees Pisco mixed with sugar and fresh lemon juice) in either Bellas Artes or Bellavista: two lively barrios lined with bars serving potent Pisco Sours. Tasteful trinkets to remind you of your stay in Santiago include silver jewellery made with lapis lazuli (a deep blue semi-precious stone found in the Chilean Andes), copper goods, Andean textiles and alpaca shawls. For funky fashion created by a Chilean designers, Patio Bellavista is the answer. Meanwhile, football fans might want to purchase the Chilean strip. Every Santiaguino has their favourite club team but all support La Roja (the Red), aka Chile’s national team. British Airways flies direct between London and Santiago on Mondays, Tuesdays, Thursdays, Saturdays and Sundays on the four-cabin Boeing 787-9 Dreamliner. The flight takes 14 hours, 40 minutes making it British Airways’ lengthiest long-haul route. Santiago regularly ranks as the safest metropolis in South America and for good reason: dangerous crime is virtually non-existent. That said, Santiago is still no Copenhagen so be aware of pickpockets and bag snatchers and keep your items close to you particularly around Plaza de Armas, Mercado Central and Cerro San Cristóbal. Santiago is a good destination all year round but the best time to sail to Santiago is from September to November (spring) or from March to May (autumn), when the weather is warm but not stifling so. Unlike its South American siblings, Rio de Janeiro and Buenos Aires, both of which never sleep, Santiago shuts down on Sundays.